Hello Fellow Healthcare Worker! Having managed so far to avoid being fired for refusing the seasonal Flu vaccine, with methods ranging from Religious Exemption, to Mask-Wearing, here are some of my observations “from the field”, in hopes that you may find something that will be useful in your own situation. Desperate times call for desperate measures, and in America, Civil Disobedience has a long and effective history of being utilized by those oppressed, to bring attention to their plight, gain sympathy from persons of influence, and change the course of the national conversation regarding their cause. The more trouble for the employer that we can make of Mandatory Vaccination Time, the more annoyed they will be with the whole process. Most people really don’t like having to get shots. This includes some managers, Human Resources personnel, the Infection Control team, Pastoral Care staff, administrators, office staff, and legal department personnel. These people are not likely to go against the tide. In fact they usually “go along to get along”. However, at least some of them must secretly be a little disgruntled about the whole thing. Some may even be secretly cheering us on. Let’s leverage any support we can get from them. If they are not against us, they may potentially be for us. The more of a hassle it is to get the 90% vaccination rate and to fill out and submit all the necessary documentation, plus the nuisance of annually dealing with exemptions, declinations, and documenting and policing all of that, the worse of a taste it will leave in people’s mouths. Having a substantial portion of the employees wait until the last day, would surely cause some teeth-gnashing in the Infection Control office. They may move back the deadline, in which case the staff should take advantage of getting to wait longer! Wouldn’t it be great if this really did catch on as a national thing? The public would have to ask, why ARE all those healthcare people putting off getting THEIR shot until the last possible day? Some light bulbs may go off above some people’s heads. Below are some examples of nonviolent civil disobedience that hospital employees can use that will help highlight the unfairness and absurdities of coercive flu vaccinations (which are usually ineffective and, in most years, also unnecessary). Coerced flu shots are also in total violation of the sacred principle of informed consent. 1) Don’t go to the vaccine pushers, make them come looking for you. If you are in danger of being fired over the issue: Drag out all interactions. Don’t respond to emails right away. Make appointments for meetings as far in the future as possible. Make the meetings last a long time. If you are handed something to read and/or sign, take as long as possible reading it. Ask for clarification. Pause a long time to digest the “clarification”. Also, most people don’t realize, they usually don’t have to sign anything “right now”. Say you would need to take a copy home with you so you can research it further, or talk it over with “someone”. Then, don’t be in any hurry to return the paperwork. If they press you to return it, say you need more time. You might even misplace it! 2) Regarding signing anything, follow suggestions others have posted to NAMV, such as, drawing a line through things you don’t agree with, writing in your own statements, and then sign “Under Duress” next to your signature. If you have to write in a reason for declining, you can type your statement out, print it off, then make a copy of their paper with your typed statement superimposed over the area where you were supposed to handwrite an answer. (It helps to use a bolder typeface than their paper used.) It looks much more serious & professional, when you can turn in a paper that they thought would have a little handwritten statement on it, to rather look like you mean business. Insist on having a copy of everything. 3) If you have to meet with management or Human Resources, try to meet with just one person. Then after that meeting, request to meet with their superior, or your superior, or any other department you can think to involve, but make the meetings one at a time, and as many days apart from each other, as possible. The goal is to stay employed as long as possible, plus those meetings should be on paid time, right? 5) If you are to be terminated, DON’T Resign! Don’t go with quiet dignity. Be angry (not threatening) or miserable, whichever feels right to you. Make them (from the higher-ups to the secretaries) look you in the eye. Make them squirm with discomfort. Try to make sure their consciences bother them. Your tears affect your fellow humans at the gut level. Especially in health care, where empathy is hopefully in greater supply. Take a long time to clean out your desk, locker, etc., and do it when there are likely to be the most people around. Write farewell notes. We want this to affect morale. If coworkers are fearful and resentful, and higher-ups are feeling, used, guilty, and uncomfortable, that is as it should be. 6) Once terminated, gather your quiet but cheerful dignity about you, hold your head up, and go back to visit often, taking cookies to former coworkers, visiting patients, eating in the hospital cafeteria, (lunch dates with former coworkers? ), visiting the chapel, anywhere where members of the public can be. Smile a lot. You are free! 9) Be sure to seek medical attention to document the traumatic after effects and difficulties you have been put through (whether submitting to the shot or not). If you absolutely feel you have no option but to get the shot (nursing students have my greatest sympathies here! ), you may find that being forced into having a vaccination is likely to haunt you and be memorable to you for a long time. The person who gives you the shot may also find it a memorable experience. Your soul is likely to be in agony over this and you may find yourself giving it full expression at the time the shot is being given. Don’t be surprised if you find yourself letting out your pent-up frustration, screaming, sobbing, hyperventilating, writhing, jumping around, yelling, knocking the syringe away, all giving expression to the angst you are feeling at this violation of your body and your conscience. When you finally get control of yourself afterward, you may need to explain that the symptoms were out of your control. You may wish to ask the person who gave you the shot, to then help you fill out and file a Vaccine Adverse Event Report (VAERS) to the government, and, be sure to mention that you hope you don’t get Post Traumatic Stress Disorder (PTSD) from this whole event. If you DO experience symptoms such as sleep disturbance, depression, crying for no reason, anxiety, nervousness, appetite disturbances, poor concentration, flashbacks, or feeling ill when you have to be around needles at work, etc., be sure to seek medical attention to document the after-effects and difficulties you are having. If you do end up having to sue for workplace trauma or file a disability claim it will be very important to have documents with dates, times, who, what, where, and, of course medical records showing how forced vaccination has adversely affected you will be very helpful. Be brave, fellow Healthcare Worker, and remember, while the other side accuses us of not protecting our patients, understand, we ARE protecting them from something far worse than Influenza, by fighting to protect the right to Informed Consent and the right of competent adults to control their own healthcare decisions. This IS for our patients! 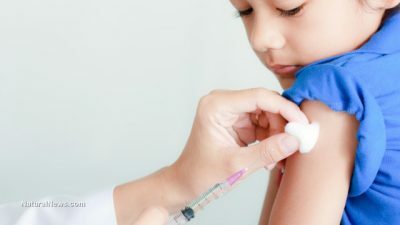 This article was originally published at Nurses Against Mandatory Vaccines.